From 1976 comes this classic ORIGINAL COMIC ART from THE AMAZING SPIDER-MAN; KING-SIZE ANNUAL# 10 page 37. 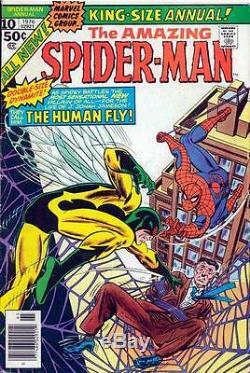 The art features the 1st appearance of Spider-Man's super-villain; "THE FLY", in an all-out battle, with the web-slinger in every panel. 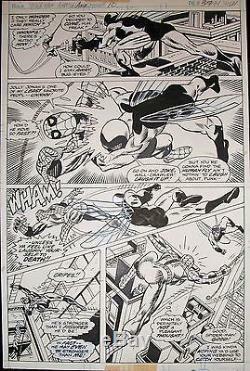 Pencils were done by Spidey artist, and legend, "GIL KANE". Inks were contributed by two other SILVER AGE Marvel Masters; FRANK GIACOIA & MIKE ESPOSITO. The art is in excellent condition & comes from a smoke-free home. All original art is packaged flat, firm, and damage free. I GO TO EXTREMES TO SEE THAT THE ART IS SECURELY PACKAGED BEFORE BEING SENT OUT. A SCAN OF THE COVER IS ONLY HERE AS AN EXAMPLE TO SHOW WHAT THE ART WAS CREATED FOR. The item "AMAZIING SPIDER-MAN ANNUAL #10 / ORIG ART/ 1976 THE FLY/ KANE/ GIACOIA/ ESPOSITO" is in sale since Wednesday, January 04, 2017. This item is in the category "Collectibles\Comics\Original Comic Art\Other Original Comic Art". The seller is "rockin_art" and is located in Henderson, Nevada. This item can be shipped to United States.